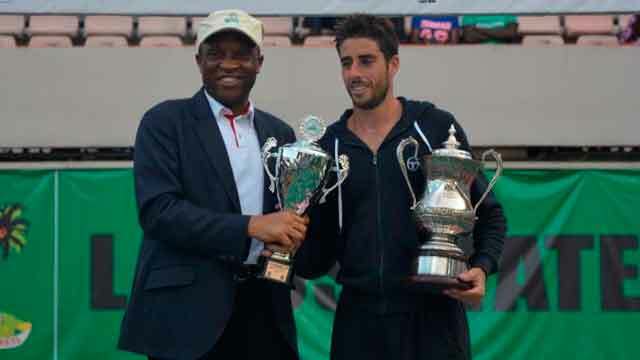 Thunder struck for the second time at the Lagos Lawn Tennis Club at the weekend when Spain’s Enrique Lopez-Perez beat France’s Gianni Mina to reclaim the men’s title at the first leg of the Governor’s Cup Lagos Tennis Championship. 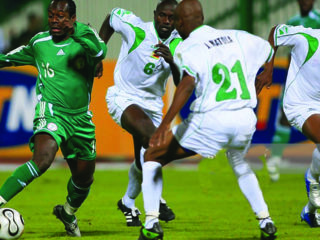 The Spaniard first won the title in 2012, but the way he celebrated after beating Mina at the centre court of the Lagos Lawn Tennis Club on Saturday portrayed a player, who had since been longing for another trophy.He won the game 6-2, 6-7 (7), 6-1 to set a marker for the second leg, which serves off at the same venue today. In the women’s singles final, Slovak Majeric, who won the final in the 2013 edition and was runner up in the 2015 competition, also made it title number two when she beat a consistent regular face in the Governor’s Cup in the last six years, Swiss Conny Perrin, 3-6, 6-1, 6-1. The duo of Chayenne Ewijk and Rosalie Van Der Hoek, both from The Netherlands, beat the pairs of Valetini Grammatikopoulou from Greece and Indian Prarthana Thombare in straight sets of 6-3, 7-5. Lopez-Perez teamed up with Holland’s Boy Westerhof to beat the pair of France’s Calvin Hemery and Gianni Mina in straight set of 6-2,6-3.